As leaders from the U.S. and China meet this week in Beijing to discuss a range of economic and political issues, Americans are more likely to support stronger economic ties with China than a tougher approach. About half of Americans (51%) say it is more important to build a stronger relationship with China on economic issues, while 41% say it is more important to get tougher with China, according to a poll conducted Feb. 12-26 among 3,337 adults. This data was released in the Pew Research Center’s political typology study on June 26. Public support for a strong economic relationship with China has bounced back to where it was three years ago, after declining in 2012. Two years ago, the balance of opinion was the opposite. 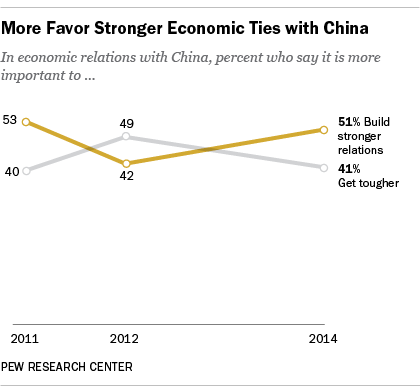 Nearly half (49%) of Americans in 2012 said it was more important to get tougher with China, while fewer (42%) viewed a stronger relationship as more important. This trend can be seen across most groups; support for stronger economic ties has grown, but there continues to be substantial age and partisan differences in priorities for the U.S.-China economic relationship. Fully 72% of those under 30 prioritize stronger U.S. economic ties with China compared with just 23% who say it is more important to get tough with China. Older age groups are more evenly divided in views of priorities for U.S.-China economic relations. Republicans, especially conservative Republicans, remain more likely than independents or Democrats to favor a tougher approach to China on economic issues. 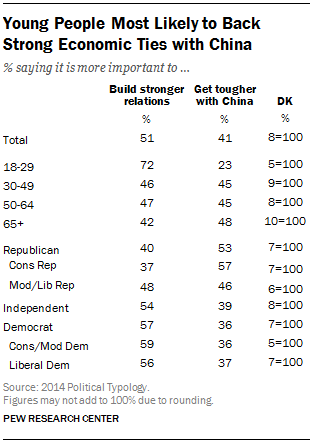 A majority of conservative Republicans (57%) favor getting tougher with China. That compares with 46% of moderate and liberal Republicans, and smaller percentages of independents (39%) and Democrats (36%).